Bring a a hat, sunscreen and drinking water, plus gloves and a trowel if you have them. Community plantings are much easier and more enjoyable if there are a lot of volunteers to help. Ten years ago there was sometimes a hundred volunteers at a planting. Last year at the first planting at Yungaburra nearly 70 volunteers came along which was really good but at the last planting at Jaggan we had only 29 people to plant the same number of trees. There's always been a core of dedicated TREAT planters but some new faces at plantings would be most welcome. TREAT has about 430 member households and most of these are on the Tablelands. Some older planters have necessarily had to give up, but would able members please set aside some time this season to help us plant. Bring along friends (they are community plantings) and join in a TREAT barbecue afterwards. Every planting is different. Some are easier than others, depending on moisture in the ground and soil type, whether there's been rain or sun since holes are dug, and mulch for the trees may be from grass nearby or hay bales. If all goes well, a planting should take only a couple of hours. If you are thinking of doing a small planting at your own or a friend's place, planting days are a great way to learn how to plant trees, prepare for a planting and care for it afterwards. Many volunteers have done plantings on their properties and are always happy to share information and experiences as they plant or afterwards at the barbecue. Funding has come from the Reef Rescue program which is part of the Australian Government's "Caring For Our Country" funding program - see David Hinchley's article this newsletter. Stage 1 will address sediment impacts and water quality with an added benefit to biodiversity. Activities include storm water drain realignments, river bank armouring, fencing off livestock, removal of Coral tree patches and tree planting. BRICMA is working in partnership with Tablelands Regional Council who will supply trees and carry out maintenance and Conservation Volunteers Australia (CVA) and TREAT who will plant trees. The planting site is on Coleman West Road off McKeown Road. The planting of approximately 3,000 trees will complete National Parks' revegetation of a cleared area on the southern side of the road where work has been in progress since 1998. The area has had its share of problems and the planting on 21st March will be to infill the 2007 and 2008 plantings. The planting site is on the Old Palmerston Highway towards Ravenshoe. There will be two plantings on the Mete property this year, revegetating an area over which there is a Conservation Covenant and which contains some remnant forest. Our first planting on the Mete property was on 1st November last year when 660 trees were planted further upstream above a dam. This was a well attended community planting and was completed in record time with the small number of trees to be planted. Funding for this small planting came from NHT's Envirofund program but funding for this year's plantings will be from Terrain NRM. Tablelands Community Revegetation Unit (TCRU) will be doing the site preparation and maintenance. The planting site is on Hunt Road off Peeramon Road. Caroline and Philip Emms have bought the property adjoining the eastern side of Lake Barrine National Park and extending to Toohey Creek and Donaghy's Corridor. The property contains a triangle of land across the creek and Caroline and Philip have revegetated this with 7,000 trees to strengthen the connection with the corridor. TREAT assisted with a planting there of 1,600 trees on 29th November and Conservation Volunteers Australia also helped with a program of work there. This a significant area and Caroline and Philip have applied for a Nature Refuge Conservation Agreement over that part of their land which includes the creek and triangle. A fenced buffer strip already exists next to the National Park at the northern end of the property and this community planting will expand wildlife habitat there. Caroline and Philip's work is privately funded. The planting site is on Pressley Road off the Gillies Highway. This year Mike and Robin Carter are completing the revegetation of an area previously cleared for cattle. Last year TREAT helped plant on the ridges and this year they will link up with the gullies which retained some remnant vegetation. CVA will also be helping with planting and will be infilling another area originally planted for timber 10 years ago but which will now be left for biodiversity. The community planting will be the last of this series of their plantings. It is privately funded. The planting site is on Hillcrest Road. The BRICMA Green Corridor project held its third Tropical Tree Day Planting at the Bonadio farm on the 6th Dec in partnership with TREAT. Approximately 40 tree planters attended and 1,500 seedlings were planted in 2 hours, followed by a well organised TREAT BBQ (fantastic as usual) in one of the ecotourism facilities on the farm. Alan and Ron Bonadio sprayed the site with a boom spray, slashed it twice, ripped it and installed an irrigation system and these activities help us to keep our preparation costs down so funds can go to the ever important maintenance. To date the Green Corridor program has planted approximately 22,000 seedlings on the Bonadio farm over 12ha consisting of 7.6ha intensive planting (2,500 to 3,000 stems/ha) and 4.3ha remnant enhancement. All the intensive sites were once regional ecosystem 7.8.37 (Mabi on alluvium). This situation presents many challenges to operations such as: frost, floods, enhanced weed growth, lack of naturally occurring pioneer species and the semi-deciduous nature of Mabi ecosystems. The program has tried a few different approaches to layout design, for example: at our first Tropical Tree Day planting near the bridge on the left going to Atherton we mainly used Melia as our pioneer (3% of planting) and across the road we introduced Homalanthus combined with Melia (10% of planting). We decided the use of Acacia species was not suitable and especially A. Melanoxylon which is showing weed potential in older plantings in the area. After two years in the ground and the challenges mentioned above it seems maintenance on Mabi river flats will be needed for 5 years, with a contingency plan for possibly 5 more. The applications are considered at the next management committee meeting and these meetings are held on the second Monday of each month. Where possible and necessary, members from the committee and/or nursery staff will visit the planting site. If an application is approved the nursery staff need to be contacted prior to the trees being collected. The approval letter received is given back to TREAT when the trees are collected, along with any donation being made to the Environmental Benefit Fund. The number and species of trees will be added to a data base of where trees from the nursery are planted. If an application is unsuccessful an amendment may be suggested and the application can then be reviewed. If suitable trees are unavailable an application can be represented at a suggested later date. The maximum number of trees in a year which can be obtained by a member is 300. This is a significant number of trees to maintain, especially for newer members. Members may apply for further trees in another year. Regular Friday morning volunteers may apply verbally for less than 100 trees. All members are entitled to 10 trees each year but this number is not cumulative. Members are encouraged to seek advice on their planting from the nursery staff and/or TREAT before submitting an application. If you wish to come to the nursery on a Friday for this, please ring either the nursery staff (4095 3406) or Barbara Lanskey (4091 4468) during the week to ensure your visit will not clash with some Friday event and nursery staff will be available. The Australian Government has recently released its Caring For Our Country Business Plan outlining programs and priorities for funding for 2009-2010. Caring For Our Country is now the main source of Federal government funding for natural resource management available to community groups as well as non-government organisations and government agencies. It started on 1 July 2008 and replaces the National Heritage Trust, and includes other programs such as the National Landcare Program, the Environmental Stewardship program and the Working on Country Indigenous land and sea ranger program. Up to $260 million is available across Australia through the Business Plan. The Business Plan for 2009-2010 focuses on six national priorities: the National Reserve System; biodiversity and natural icons; coastal environments and critical aquatic habitats; natural resource management in northern and remote Australia; sustainable farming practices; and community skills knowledge and engagement. The aim of the business plan is to seek proposals in these priority areas for Australian Government funding. This is a key opportunity for funding natural resource management in the region, so Terrain NRM will be working with and supporting its members and partners throughout the Wet Tropics region to develop high quality proposals that meet the priorities identified in the Caring For Our Country Business Plan and stand a good chance of being funded. For those of you who haven't yet had a chance to look at the Business Plan, below is a summary of the priorities and requirements outlined in the Plan that we will need to keep in mind when developing proposals. Community Skills, Knowledge, Engagement - engaging indigenous communities through developing indigenous partnerships and the use or recording of traditional knowledge, assisting local communities to improve knowledge and skills, and increasing participation in NRM including recruitment and retention of volunteers, particularly youth and short-term visitors. Indigenous best management practices will also be supported, e.g. through using traditional ecological knowledge in developing Indigenous Protected Area management plans. The Business Plan is calling for proposals for small, medium and large grants. Proposals for each of these need to specifically address the targets outlined in the plan. There is a strong emphasis on the need for partnerships and Traditional Owner engagement, especially for the large and medium grants. Large scale projects can have a budget of up to $20 million in total over 4 years and it is expected that only two or three large scale projects will be funded across Australia each year. The plan includes ten concepts for potential large scale projects, one of which is for saving the species of the Wet Tropics through habitat protection. Large scale projects must build on existing investments and have a high degree of integration and strong governance structures across interest groups. The Plan calls for expressions of interest for large scale projects by 6th March 2009. Selected proposals will then be invited to submit full proposals by July/Aug 2009. Medium scale projects are expected to achieve progress on multiple targets at a landscape scale, and can have a budget of up to $2-3 million per year. They will also be expected to include a community component (e.g. Landcare groups, local indigenous people). Full proposals for medium scale projects have to be submitted by 6th March 2009. Proposals for small-scale grants of between $20,000 and $100,000 that contribute directly to the achievement of Caring For Our Country targets also need to be submitted by 6th March 2006. Small-scale grants are intended for community groups and networks and project application forms will be available on-line at www.nrm.gov.au. The Australian government also expects regional organisations such as Terrain NRM to support coordination of local level projects and to provide support to community groups (e.g. through devolved grants) under the Community Engagement and Participation targets and the Coastal small projects. The Reef Rescue program is also part of Caring For Our Country and the Wet Tropics region has received Transition Year funding of $6.5 million, primarily for incentives for the uptake of agricultural practices that deliver reduced nutrient, chemical and sediment loads to the Great Barrier Reef lagoon, as well as providing funding for catchment rehabilitation work. The incentives program, which is being run by Terrain NRM and industry partners, is already underway, and applications are now being invited for on-farm devolved grants of between $2,000 and $40,000 for individual farm enterprises; and cross-farm devolved grants of between $2,000 and $150,000 for groups of two or more farmers. Application forms and guidelines are available at www.terrain.org.au or Terrain's Innisfail offices on telephone 4043 8000, fax 4061 4677 or PO Box 1756, Innisfail 4860. Applications close 13th February 2009. The Business Plan also calls for regional proposals for the next round of the Reef Rescue program by 30th March 2009. Tony Irvine died on 28th October 2008. He was 70. He leaves his wife Helen and their four children Marc, Sophie, Rina and Ian. Tony came to the Atherton Tablelands in 1971 to work at the newly established CSIRO Tropical Rainforest Research Centre and fell in love with north Queensland tropical forests. He developed an enormous knowledge about native flora and had a special interest in tropical palms, on which he became an authority. In 1983 he described and brought to the world's attention a new genus of palm, Wodyetia bifurcata, commonly known as the foxtail palm. It is now widespread in parks and gardens. Tony was a superb bushman and taught bush survival skills to a wide range of groups from secondary school classes to army commandos. Tony was an "uncle" to five different indigenous groups. Tony's special contribution to society was as an advisor and encourager of community-based conservation groups such as Society for Growing Australian Plants (SGAP) and TREAT. He had an unquenchable passion for native flora and planted it and promoted it at every opportunity. For his contribution to conservation he was awarded a Member of the Order of Australia in 2005. Despite such accolades Tony remained a simple, loving and caring man, who generously gave of himself to family, friends and the community. After a lifetime of activity and never standing still, Tony's quality of life deteriorated over the past five years, as he struggled with spine degeneration, Parkinson's disease and lymphoma cancer. A bright spot for Tony was a visit by a cassowary to the rainforest paradise he and Helen had created on 2.8ha on Yungaburra Road. A memorial tree planting of about 800 trees will be held on Wednesday 21st January at the north-west corner of the Curtain Fig National Park at 9.30am. This planting will buffer and expand the area of Mabi forest there in the National Park. Tony suggested the word "Mabi" to describe this endangered forest type, from the indigenous word for tree-kangaroo. Tony Irvine was one of the founders of TREAT (Trees for the Evelyn and Atherton Tablelands) and one its valuable members. TREAT is much poorer because of his death. In 1982 Geoff Tracey called together at "The Cycads", Yungaburra, a group of people interested in growing rainforest trees native to the Atherton Tableland. Tony was a member of that group and over the years since then he made a vital, professional contribution to our work. He could identify and explain the value of any rainforest specimen given to him. The seminars he conducted at the Lake Eacham National Parks nursery were attended by many keen members to learn more about the many interesting rainforest trees native to our area. 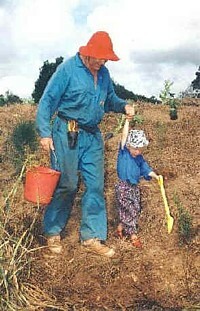 Tony worked at the CSIRO in Atherton and lived on a block of land which he turned into a rainforest with his plantings. Pelican Point, near Tinaroo, is a beautiful place, planted with innumerable species of trees including rainforest trees. Tony had a vital hand in planning, planting and cataloguing these trees. It is well worth a visit. TREAT and all tree-loving Tablelanders mourn Tony's passing and thank him for his inspiration in tree-planting. Humility, compassion and intellect. . . . . most of us would be happy to have one of these character traits, but Tony Irvine had them all and in no small measure. That familiar figure in the blue overalls and orange hat, bursting with enthusiasm, is one of those 'things' which many of us will associate with tree-planting days for many years to come. But away from that there was much to admire in Tony Irvine. A passionate advocate for indigenous culture he was. The Foxtail Palm was of course described by Tony after he and colleague Don Fitzsimon travelled to Cape Melville and confirmed a new species to science. In typical Irvine fashion he named the palm Wodyetia - after Wodyeti the last indigenous chief from the Melville area. Typical in the sense that Tony had tremendous respect for knowledge, and to Tony, indigenous knowledge was time honoured and tested, and deserving of respect. I think it's fair to say indigenous people both loved and respected Tony - loved him for his respect of their culture and respected him for his knowledge of nature. An equally passionate voice could always be expected from Tony when it came to all things Australian. Whether it was Aussie Rules, our remarkable flora and fauna, or the Australian Labour Party, Tony could be relied on to talk about ideas and concepts which came from a deep understanding and considered opinion. The Irvine wit always lurked close to the surface though, but a funny wit, not one based around denigration of others or their opinions. I spent time working with Tony at CSIRO before commencing a long association with him through our tree planting days at TREAT. Like many others I benefited tremendously from his generosity, and all members of TREAT have in some way derived a similar benefit. We will all be sorry for his passing, but then so should the world - a more staunch defender of life on earth would be hard to find. Tony Irvine was a foundation member of the Tablelands Branch of SGAP, having attended the inaugural meeting in February 1980. It is hard to imagine excursions into the bush without Tony in his red hat, pointing out this, explaining that, telling stories about plants and people, patiently spelling botanical names and repeating them again for those that missed it, waiting for slow ones to catch up, helping the older ones over rougher ground, looking out for everyone. . . .he really was a very special person. Tony mixed readily with people at all levels of botanical knowledge, from the raw beginner to the informed amateur to the professional scientist. He was noted for his patience and for his ability to reduce scientific information to a level which was interesting, informative and understandable by people of all backgrounds and walks of life. The strength of the Tablelands Branch over the last 28 years, the extent of the knowledge of our native flora that now exists in our local community and the prominence of our local flora in our gardens and landscapes is testimony to the dedication, drive and influence of Tony. His contribution to the knowledge and love of our native flora was immense and he is one of those people who really has left the world a better place. Though we are part of a State Government agency, pest management prioritisation must occur not only at a State level, but also by necessity on a more regional and local level. Our tablelands Environmental Protection Agency (EPA) staff direct energies towards the control of pests recognised at a State level, but also at pests with significant environmental impacts that may be of greater significance for our tableland flora and fauna. State recognised pests are those declared pests that landholders are required to control. On the tablelands, EPA staff assist in control of the class 1 weed, Thunbergia laurifloia (blue trumpet vine). We are aiming to eradicate a population on The Old Cairns Track not far from Gourka Road. Though related to other Thunbergia species (that have lesser declaration status), T. laurifolia is not as widespread and the hope is that with dedicated effort, populations of this smothering vine can be eradicated. The noxious fish Tilapia mariae has recently been introduced to Lake Barrine through unknown means. Whilst DPI staff lead the control of this pest on a State wide basis, our staff act in support of the DPI and traditional owners in control efforts at Lake Barrine. To date, electrofishing and trapping has proven relatively unsuccessful. The latest method being trialled is the introduction of an artificial nesting substrate to encourage egg laying on material that can then be removed from the water before eggs hatch. The establishment of the salvinia weevil breeding facility at Restoration Services, is intended to assist the EPA and the community in the control of the class 2 weed, Salvinia molesta. If you don't know what this potentially smothering water weed looks like, ask our staff for a tour of the facility. This biocontrol agent has proven very successful in controlling Salvinia outbreaks in north Queensland, and we are looking forward to the first release of some EPA weevils in 2009. Feral pigs and wild dogs are both class 2 declared pests. On the tablelands, neighbours to EPA estate with feral pig problems are provided with traps and advice in their operation. The traps are loaned on an "as required" basis. In other parts of the Wet Tropics, the EPA in partnership with other bodies, funds professional trappers in more sustained feral pig control activities. When neighbours are experiencing significant economic loss due to wild dog activities, our Tablelands staff will endeavour to join in coordinated wild dog baiting activities led by local authorities on a coordinated neighbourhood basis. Experience shows that to be effective, baiting needs to be widespread and sustained. Our staff led by Resource Ranger Ray Albress are currently busy joining with neighbours in wild dog baiting activities on the southern tablelands. In prioritising the extensive remainder of the "environmental" pests on EPA estate, we undertake a planning exercise that balances the threat posed by any particular infestation, against the feasibility of effective control activities to result in a prioritisation that guides our limited resources in targeted pest management work. We compile the results of our planning into a pest management strategy that is reviewed on an annual basis to ensure we respond to new and emerging threats. Resource ranger Ian Holloway is presently leading our yearly review. The most important "non declared" pests on our plan include the suite of vines that have threatened to smother a portion of the north western corner of the Mabi forest in Curtain Fig National Park. This Commonwealth recognised critically endangered community suffered extensive canopy damage in Cyclone Larry, allowing Turbina corymbosa, Anredera cordifolia (Madeira vine - class 3) and Aristolochia elegans (Dutchman's Pipe - class 3) to spread their respective areas of influence. Weighing up the level of threat and feasibility of control, this area receives a high priority for control efforts. The TREAT Tony Irvine memorial tree planting will expand the Mabi forest in this area, but also importantly over time provide essential shade to limit the competitive advantage of these light seeking exotic vines. When assessing the threat posed by a pest species, ecological context is all important. Whilst we may view Lantana camara as a significant threat in the drier parts of the tablelands where it has the propensity to spread and dominate the understorey, small roadside infestations adjacent to remnant rainforest are of much lesser threat potential as the likelihood of spread is very low in the absence of significant disturbance. Whilst we would like to think that remnant rainforest, in the absence of disturbance, is largely immune from weed infestation (other than on its edges), there are some weed species that have the potential to spread even here. Three species that we have on our radar are Chukrasia velutina (east Indian mahogany), Cedrela odorata (west Indian cedar) and Coffea arabica (coffee). The first two are introduced commercial forestry species and the last one, well I'm sure we all know what that is! All have shown the capacity to grow, reproduce and spread in otherwise undisturbed remnant rainforest. The EPA is eradicating a population of Chuckrasia, not far from the site of the fallen giant red cedar tree in Gadgarra Forest Reserve. Many trial forestry plots were planted in this area well prior to World Heritage listing and this legacy in some cases will need to be managed to ensure the World Heritage values are maintained. It is a complex and sometimes controversial task, ensuring that our limited public resources produce the greatest community benefit. And I haven't even mentioned the pest management work that our staff undertake to keep our public use areas looking presentable. So, the next time you see an EPA crew undertaking pest management work, you may perhaps understand a bit more of the background about why they work where they do. After approximately ten years of revegetation efforts along Peterson Creek, only a few gaps in the riparian corridor remain. To assess the ecological effectiveness of this project, various avenues of research (e.g. wildlife movement, erosion control) will hopefully begin. One such project, water quality monitoring, was proposed in 2006 by TREAT but not enacted. In September of 2008, this project was revitalized by the School for Field Studies working in partnership with TREAT to conduct monthly testing (at a minimum). To increase the scope of the project, we expanded the original parameters to include several sub-catchments in the upper Barron River system, some along most of their reach from headwaters to Lake Tinaroo. Peterson Creek, including Lake Eacham, provides the impetus for the monitoring: to what degree are the revegetation efforts affecting water quality? Because a corridor is envisaged between Curtain Fig National Park and Wongabel State Forest, we also included Leslie Creek and its main tributary Gwynne Creek, to establish baseline data with which to compare post-revegetation. Additionally, we are testing the Barron River from Mt Hypipamee to Picnic Crossing, and Severin Creek with its tributary Patterson Creek from the SFS - Centre for Rainforest Studies property to Lake Tinaroo (see Figure 1). Figure 1: Sampling sites in the upper Barron River catchment. Our testing follows the guidelines set up in the original plan (water temperature, turbidity, pH, dissolved oxygen, dissolved solids, and electrical conductivity), though we have also begun preliminary studies of macro-invertebrates, canopy cover and land use. Water testing from six days September - November 2008 were all dry season results, with one rain event exception. Since most pollutants enter the waterways during rain events, our dry season data showed little variation between creek systems or even over time (we compared current values with Peterson Creek values from the 1990s Waterwatch program). In general, dry season water quality in all stream systems was relatively healthy. Sites grouped by % canopy cover. See map for site code locations. These trends seem to indicate revegetation efforts are vital to a healthy waterway system and improved water quality. They also seem to indicate that more time is required in the restored areas until the full water quality improvements are realized. Wet season testing may help further differentiate these creek systems' water quality and their relationships to riparian revegetation and integrity. Future plans are to continue monitoring indefinitely. At this point we are seeking funding for nutrient and chemical testing, which would provide valuable information on (especially) agricultural runoff. In May we will compile wet season data and provide another report on our findings. In 2009 this work will continue, again with the assistance of students from The School for Field Studies. We are still interested in obtaining records of this species at sites around the Tablelands so if you spot a big turtle with a white throat and/or chin and perhaps with a pink nose please let me know. In November TREAT received a cheque for $1,000 as a donation to the Environmental Benefit Fund from Trinity Anglican School. At the school's Coconut Carnival this year six students from Year 11 decided to sell Krispy Kreme doughnuts at a "Treat Yourself" stall to raise money for TREAT as part of their business venture program. To help the students with their stall, Dawn and Ken took down one of TREAT's mobile displays along with some brochures and a few trees. The students sold 130 boxes of doughnuts, apparently most of them in the first 45 minutes. They then had three hours to promote the TREAT message, handing out as many brochures as possible to the carnival-goers, whilst gathering donations. The display attracted much attention with many taking time to read the articles. This was a fantastic effort by the students (Emma Gowdie, Aaron Dunkerton, Karina Welch, Stephen Taifalos, Annabelle Charlton, Chris Burschyk) and we thank them very much for supporting TREAT as part of their "Green Challenge". Thanks also to Ken and Dawn for assisting with the stall's TREAT attractions. In the July-September newsletter it was noted that the Peterson Creek Wildlife Corridor had been nominated with the Ecological Society of Australia (ESA) as a project worthy of consideration to be one of their top 20 restoration projects in Australasia. Many projects were nominated and we were asked to expand our nomination for final consideration. With Nigel Tucker's assistance we added Donaghy's Corridor and the Lakes Corridor to form a project linking 3 Wet Tropics World Heritage Area (WTWHA) fragments to the adjacent Wooroonooran National Park, also part of the WTWHA, and this expanded project was successful! Nigel is now helping us with a report on the project which will be on TREAT's website in February. Successful projects will be featured via a weblink to the Society for Ecological Restoration International's (SERI) Global Restoration website in time for the international conferences of INTERCOL (International Congress of Ecology) and SERI, held for the first time in Australia at Brisbane and Perth in August. In November, Neville Simpson and myself both received Cassowary Awards. Neville's was for Education and mine was for Community Conservation. Neville has been teaching environmental education since 1973. He helped design the original TREAT on TAP program for primary schools and is currently on our EBF committee. Mine was for the enthusiastic work I've been doing with TREAT since becoming president in 2001. It was the 10th year of the awards and the 20th year since the Wet Tropics World Heritage Area declaration so it was a very special evening. On 15th November, the annual workshop had 21 attendees. Our faithful teachers were again Alan Gillanders (with assistance from his wife Maria) for Tree Identification and Peter Snodgrass for Seed Propagation. This year I had Dawn assisting with morning tea preparations and took advantage of her help to sit in on Peter's second session. There is always so much to re-learn and Peter had a wide range of seeds and fruit collected during the week. Seed availability is why the workshop is held later in the year. As usual, everyone was fascinated by the available information with lots of questions asked. Thanks again to Alan, Maria and Peter for their time in preparation as well as teaching on the day. If you are planning a restoration planting this wet season, you are by now probably well into your site preparation; if not you should consider slashing and spraying/ mulching at the first opportunity. If you have been considering a planting but are not sure where to start, it is not to late to start this season. Nursery staff and the TREAT committee and members have a wealth of knowledge and advice regarding all aspects of restoration planting. There are still plenty of trees that can be allocated for your planting, however you will need to apply to the TREAT committee for trees numbering above the membership allocation of ten trees. Members who have applied for additional trees this season should by now have received advice from the TREAT committee by letter. If you have been successful please contact the nursery by phone early in the week so that trees can be organised for pickup on a Friday morning. It is generally not practical to pick up on other days during the week and be sure to bring along your letter from the TREAT committee. During September 2008, three infill plantings were undertaken to finally complete the 2006 planting sites on the de Tournouer property on Peterson Creek which suffered substantial losses from Cyclone Larry's visit in 2006 and severe frost damage in July/ August 2007. Along with a small planting on Mete's property in early October, these plantings have successfully established. While we don't normally plant at this time of year we considered it was relatively safe to do so on these sites as we were able to irrigate right up until the rainy season if needed. The infill sites had the benefit of the surviving two year old trees being able to provide some shade and wind protection. Other measures taken to ensure the survival of seedlings were: the use of water crystals at planting, irrigating the site both before and after the planting to ensure adequate soil moisture and the use of mulch to slow evaporation. Finally we were lucky enough to receive some storms early in November. We hope to see many of you at this year's plantings and at the nursery.